Cinema can be useful for landscape architects and other designers of the built environment. Over the course of the Spring semester, Professor Chip Sullivan and I have been exploring this proposition. We have delved into the body of previous theory on the intersection between architectural design and the art of filmmaking. We have also enthusiastically worked our way through a list of “Landscape Films”, where landscapes and urban places take on more of a central role than just the setting for a story to take place; films that we believe are pertinent to the design and understanding of cultural landscape. 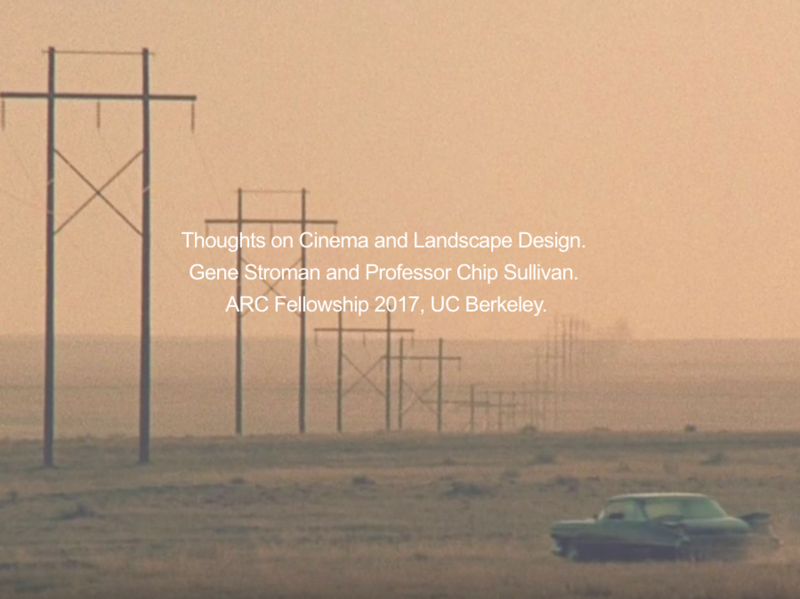 This research resulted in a series of provoking conversations about film and landscape, ranging from the particularities of set design to the landscape philosophies of certain filmmakers and their works. These weekly conversations provided a basis for further writings and drawings on the topic, and a new lens from which to approach our daily landscape design practice. So, what exactly is so compelling about the art of cinema, and how can it influence environmental designers? The list is long, and we have only begun to scrape the surface. On a practical level, cinema can function as an important research tool for designers to study the histories, existing conditions, and cultural perceptions associated with a site. Moving image can also function as a form of representation that can help to express the more ephemeral qualities of site design like light, sound, movement, impermanence, and other spatial qualities that are not as effectively covered in the toolkit in use by designers today. The history of motion picture is filled with examples of landscapes that are specifically designed and created for film, for example the artful, modernist garden of Villa Arpel in Jacque Tati’s Mon Oncle (1967) or the landscape that is used as a production camp and staging area to drag a 320-ton steamship over a mountain in the middle of the Amazonian rainforest (Fitzcarraldo, Werner Herzog, 1982). Chip maintains that many of these filmic landscapes are more successful than those designed by architects, city planners, and landscape architects. The apparent success and popularity of these filmic landscapes provoked our curiosity about the process of filmmakers, and we found that it is actually very similar to that that of the Landscape Architect; there are many lessons to be learned from a filmmaker’s approach to research, concept development, representation, storytelling, and much more. One shared interest of ours is the potential of dreams in landscape design, and we looked into the process by which filmmakers have long been able to tap into this wellspring of creativity, excelling in the translation and testing of their dreams manifested in celluloid dreamscapes. Idiosyncratic as this example may be, the synergies between the two disciplines are plentiful and can provide new insights for the development of our discipline. Many of these topics are considered and written about more extensively in a blog that we kept over the semester, Celluloid Landscape. We hope to keep posting on this page, and will publish a selection of the research (both writings and illustrations) in a pamphlet this summer. The ARC Fellowship has provided us with the opportunity to build on the interests and research we’ve developed individually over the years, but this time in a collaborative academic setting that has allowed for critical dialogue and a more effective process for shaping ideas. The research we’ve pursued has been invaluable to our own practice, and we hope that this interdisciplinary investigation can help to stimulate new ways for those in the architectural disciplines to perceive and design the world we inhabit. Chip Sullivan is a Professor, Fellow of the American Academy in Rome, author and artist who teaches in the Department of Landscape Architecture and Environmental Planning. This year he was awarded the American Society of Landscape Architects Jot Carpenter Teaching Medal, the ASLA’s highest honor for education. His latest graphic novel “Cartooning the Landscape” was recently published by the University of Virginia Press. Gene Stroman is a Graduate student in the Department of Landscape Architecture and Environmental Planning. With a previous degree and professional background in Urban Planning, he is especially interested in cities and the way in which places accrue meaning and cultural value over time. Gene is currently serving as the managing director for Ground Up, the Department of Landscape Architecture’s student-run journal.